InfoInternet is the standard for Internet light for all, the free access to text and pictures, as well as local videos, as bearers of information. Free access to information (i.e. text and pictures) is the catalyst for the Sustainable Development Goals (SDGs) of the Agenda 2030. The direct focus is on target 9.C focussing a.o. on affordable access to the Internet, which is directly addressed through the InfoInternet standard. Our expectation is that free access to information is a basis for digital health in SDG 3, digital information for education in SDG 4, and digital jobs and economic growth in SDG 8. Free digital information access will thus become a strong contributor in reducing inequalities (SDG 10), and make human settlements inclusive (SDG 11). Combining free access to information with paid access to amusement (i.e. video, gaming, other streaming) creates a sustainable business model for mobile operators and Internet Service Providers (ISPs). InfoInternet targets people, who have less than 3 US$/day. Enabling the walk on the Internet through InfoInternet is a way of reaching the people at the bottom of the pyramid, and is the entry door to inclusion in the digital society. The provision of InfoInternet is complementary to mobile operators, focussing on customers with higher ability to pay. In combination, providing InfoInternet as part of the mobile network will empower people and base their way to members of the digital society. 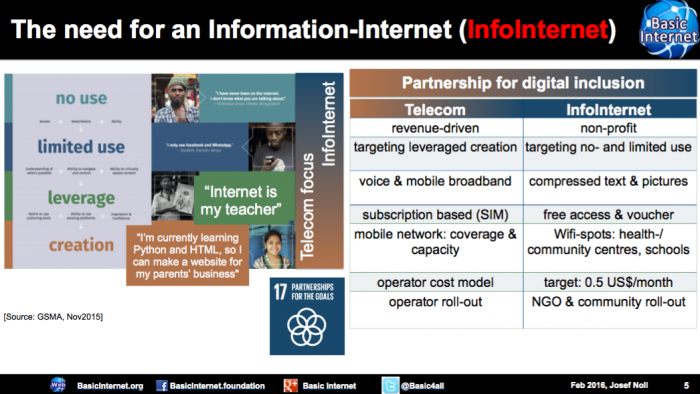 Examples of the InfoInternet are the implementation made by the Basic Internet Foundation. Discussions are ongoing on the implementation of the standard, being either a proxy, a filter, or starting with White Lists or Black Lists (see DigI:TI1.1#Content_filtering for details). Further aspects on White List filtering for access are addressed here. The InfoInternet can also be used for IoT devices to connect to and be integrated into a home network, see Masterthesis on Device Integration into the Home Network. Contains pages with keyword "InfoInternet".